Last week, I shared some of the internet marketing lessons learned by online marketing companies. The bottom line: internet advertising can be pricey especially for small companies. This week, I’m publishing an article by Conrad Saam, founder of Mockingbird Marketing who asks whether solo attorneys are priced out of SEO. What do you think? Last week I wrote a post on Lawyerist outlining the changing economics of the legal search marketing game, expressing my concern (and frustration) that BigLaw is increasingly choking the solo practitioner out of the SEO game. The posts genesis originated in my experience running an agency over the past year. I’m fortunate to belong to tight knit group (counted on one hand) of legal SEO professionals who run smaller agencies and deliver solid results for their clients. At geek conferences, we drink microbrews and share thoughts about the direction of search, rail against FindLaw contracts and trade tips about online project management systems. And we share a deep dark secret: our target market – those clients who make up the perfect client profile – does NOT include solos. Its not that we dislike solos, not that we wouldn’t take a solo, or that being a solo would immediately disqualify a prospect . . . but . . . by and large, solos can’t afford us. And its not because we are greedy and overpriced – its because the investment required to be successful in search exceeds the solos’ budget. Which really means, solos can’t afford to play in the Search Engine Optimization game. Through trial and error, we’ve learned that delivering strong results in a competitive market (think PI or any moderately large city), lawyers need to make a monthly investment of $3,000 to $6,000. This is simply beyond the marketing budget reality of your typical solo practitioner. I’m very concerned that we’ve reached a point in time where solos can’t compete in the SEO game simply because they can’t afford the investment required to deliver success. Back in 2006, when I first started in legal marketing at Avvo, one of our common refrains was that the web was the great equalizer. We cited solo firms who were aggressively and successfully competing with BigLaw on the strength of an effective online presence. Let me profile a solo practitioner, Damian Turco, who, if anyone can make it, he can. Damian has recently sold a practice in Florida and is opening up a different practice in Boston. He’s an attorney, very experienced in SEO theory and tactics, starting entirely from scratch. Damian is technical, analytical, inquisitive and ready to take a risk – ideal qualities for a search marketer. He’s so good that we wouldn’t take him on as a retainer search client because frankly he knows almost as much as we do. Boston is a large, technically city with a saturated personal injury market If the playing field isn’t level for Damian vs the Boston big firms, it sure on earth isn’t level for your standard lawyer with only a rudimentary understanding of search concepts. Can a solo practitioner, in a competitive market like Personal Injury compete? 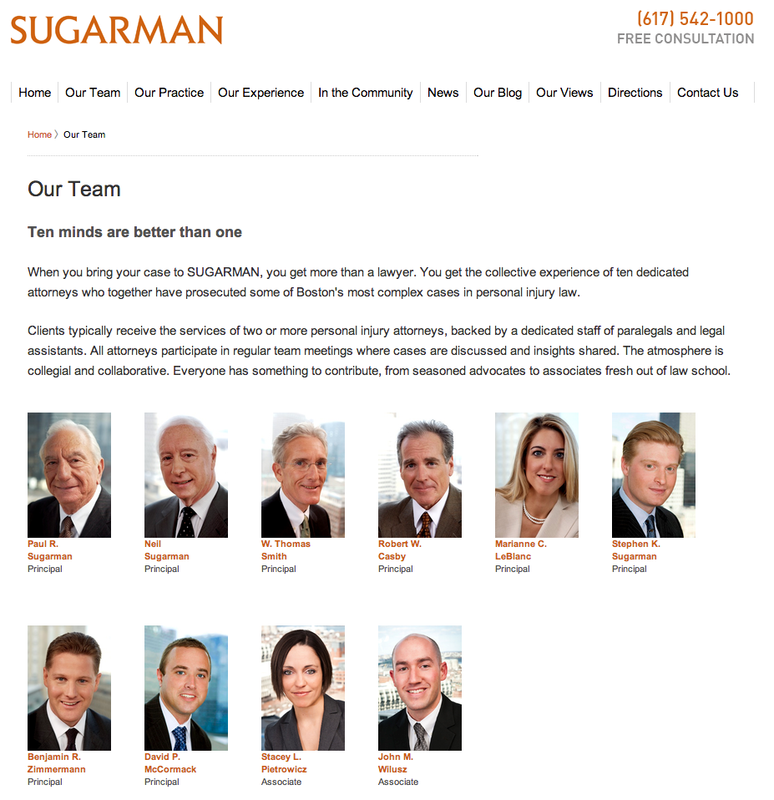 Can Damian – who puts an inordinate amount of his own time doing SEO for his site compete with huge Boston firms like Lubin and Meyer (13 attorneys), Parker Scheer (11 attorneys) or Sugarman (10 attorneys)? Large firms spending large dollars are increasingly saturating the search results in big city markets. Firms like this are increasingly employing in house content and technical teams; I’m increasingly bumping into them at geeky SEO conferences. 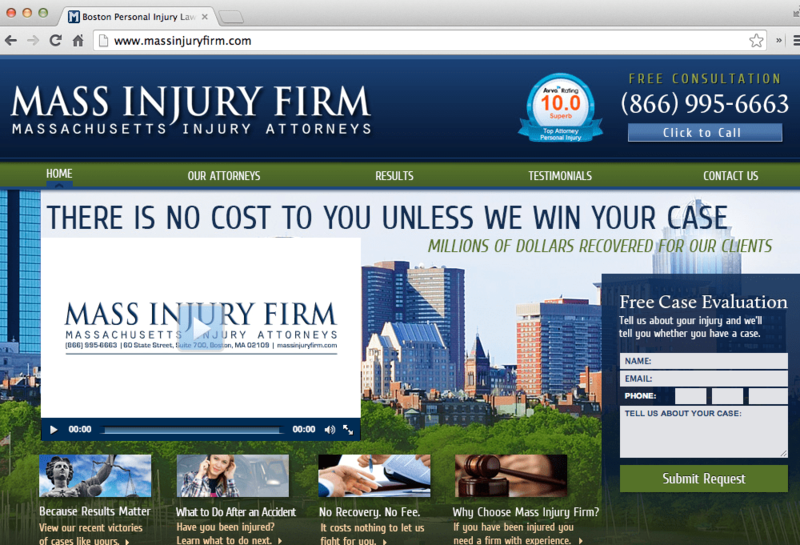 My Boston results for “boston personal injury attorney” returned eight different law firms with an average lawyer count of 7. There was only one solo in the results – supported by a Justia site (in fact Justia-powered sites accounted for 75% of the law firm results – the only FindLaw result was their directory. Here’s my primary concern: No matter how smart Damian is or how hard he works – in the face of such sophisticated, aggressive and savvy competition – how is he to build more links, generate more (quality) content, garner more positive reviews than the Sugarmans of the world? The scale of what these firms can deliver simply dwarfs the solos in their marketplace – oh and those solos should be spending most of their time actually working with clients, instead of chasing the latest algo changes. Ultimately, the return on investment for SEO isn’t there until law firms hit a minimum spend threshold. That threshold is increasingly is and out of reach of more and more solo practitioners.